The lady ginkgoes are dropping their weird, squashy fruit all over the sidewalks and the glossy, dark-fruited chokeberries have sprouted and died, which means it’s finally full fall here in Georgetown. It’s a sunny day at Dumbarton Oaks, and the signs of autumn fill the gardens. 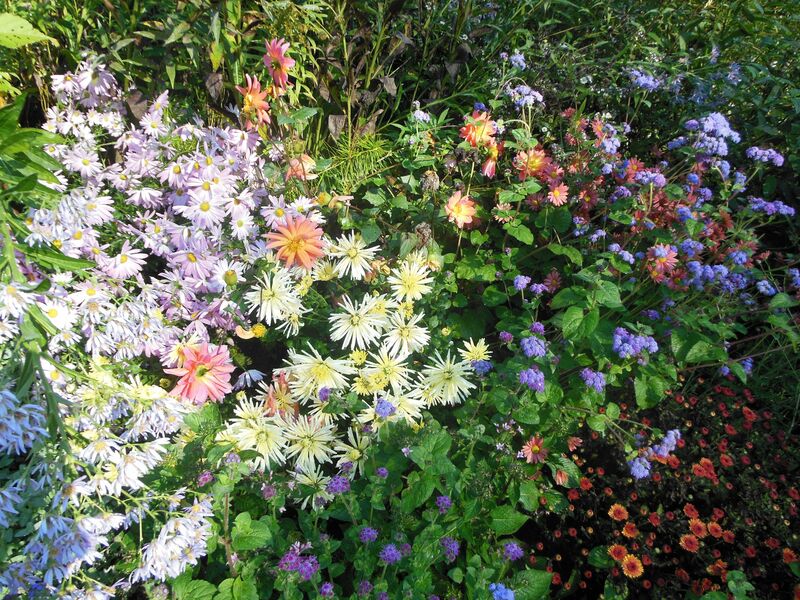 Between the pinks and oranges rapidly appearing among the green of the summer leaves and the fall flowers blooming with every shade of the rainbow, the gardens are brimming over with color. As great as the gardens look today, a wild palette of fall color can also be found inside the Dumbarton Oaks Rare Book Room. In the eighteenth century, gardeners could buy seeds from beautifully illustrated seed catalogs, showing fruit, flowers, or both. 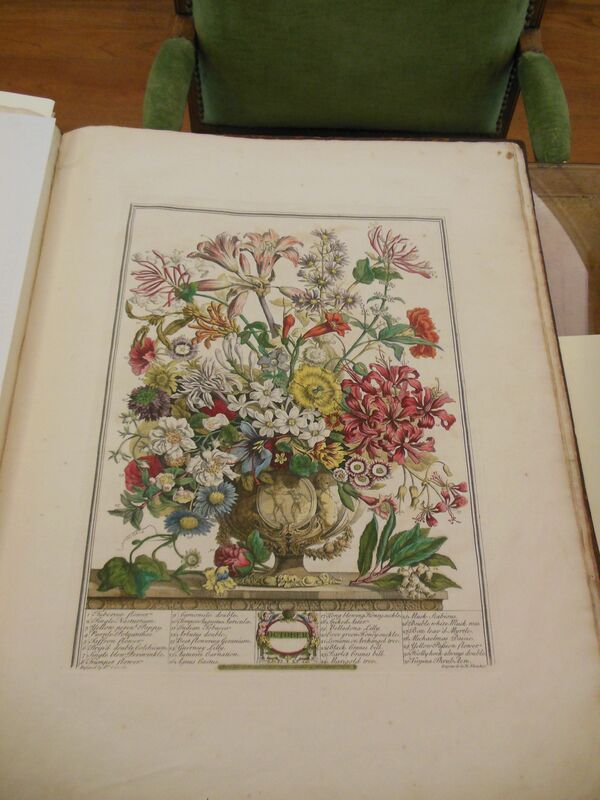 One of the first of these, and so beautiful that its illustrations were reproduced in new editions long after they stopped serving as a catalog, was Twelve Months of Flowers, circulated by Robert Furber. (He was the subject of a previous blog post here.) Below, to match the season, is the image for October. Although they’re faint in this image, each flower is numbered and labeled below. The large yellow flower at the very center of the image, for instance, is a yellow poppy, a perennial. Each of these flowers would have been available for purchase from Furber’s business, as was the print itself separate from the catalog. The Twelve Months of Flowers, published in 1730, was very popular, and followed two years later by Twelve Months of Fruit. 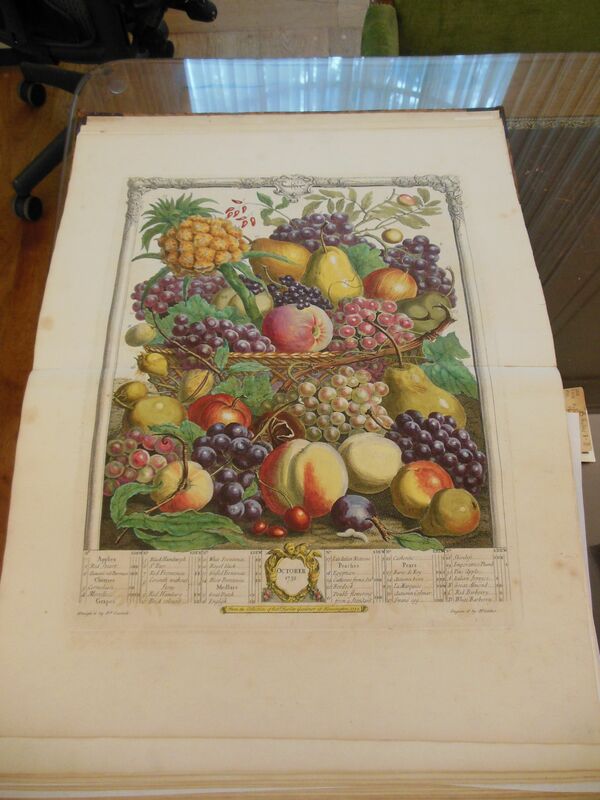 The image for October is below, full of cherries and apples and pears. None of these varieties seem to be common today, at least under the names they have here, but I think they look delicious. The Online Exhibit is Live! The online exhibit is live. Check it out! The online version of the exhibit on Pre-Columbian Processions I’ve been working on since I started here will go up early next week. At last! I’ll be glad when I get this project out into the world—and I’ll post again here as soon as it’s online. In the meantime, here are some highlights! 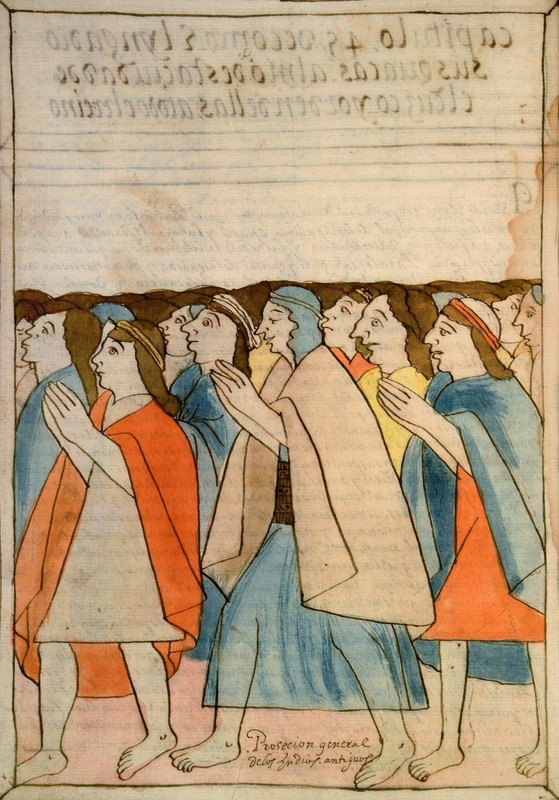 These all come from our section on illustrations of procession; since location was important to processions, the exhibit also has two sections on their spatial context. Because some of those spaces have outlasted the processions that once passed through them, their design and archaeological history can help us understand their original use. Check back next week for more on that – for now, here are some of the illustrations of indigenous processions I like the best. This citation is for a transcription of the text. I found the original handwriting pretty hard to make out! Codex Borbonicus, Bibliothèque de l’Assemblée Nationale, Paris Y 120): Vollständige Faksimile-Ausg. Des Codex im Originalformat. Graz: Akademische Druck- und Verlagsanstalt, 1974. 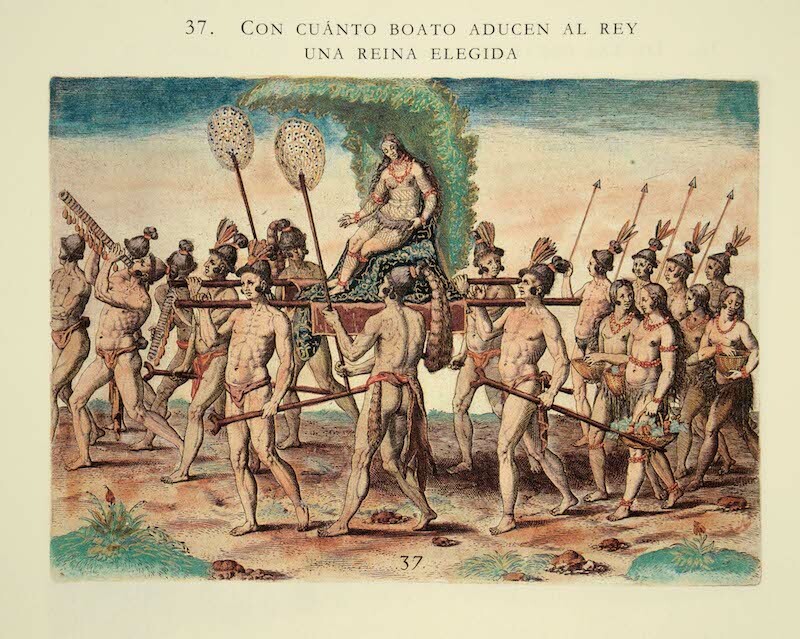 In this engraving of inhabitants of Florida, a woman and her attendants are going to meet the king she will marry. Because Mesoamerica and the Andes are usually better attested than the rest of the Pre-Columbian Americas, this image from a different region is both interesting and valuable. However, it was created by a European artist. It therefore has to be used with particular care, because European images of indigenous people often prioritized looks over accuracy. A common feature of European illustrations was to take a visual element from one indigenous culture and then falsely apply it to others. After taking a class with Thomas Cummins, I’m particularly suspicious of the litter here: the first European images of the Inca ruler are derived “from Hans Burgkmair’s 1508 woodcut Der Kvnig von Guizin (The king of Cochin)…based on Balthasar Springer’s account of his travels in India” (214-215). Two features these images had in common were that the kings in question were half-naked, wearing only loincloths, being carried on a litter. Is it just a coincidence that this engraving of a woman in Florida displays those same traits? Bry, Theodor de. América 1590–1634. Edited by Gereon Sievernich, translated by Adán Kovacsics. Madrid: Ediciones Siruela, 1992. Murúa, Martín de. Códice Murúa: Historia y genealogía de los reyes Incas del Perú del padre mercenario Fray Martín de Murúa: Códice Galvin. Thesaurus Americae. Madrid: Testimonio Compañía Editorial, 2004. Recently, the Rare Book Collection at Dumbarton Oaks added a new item to its inventory, one that had clearly been much consulted by previous owners. Many of them left their marks on the book, making the history of its previous four centuries visible today. 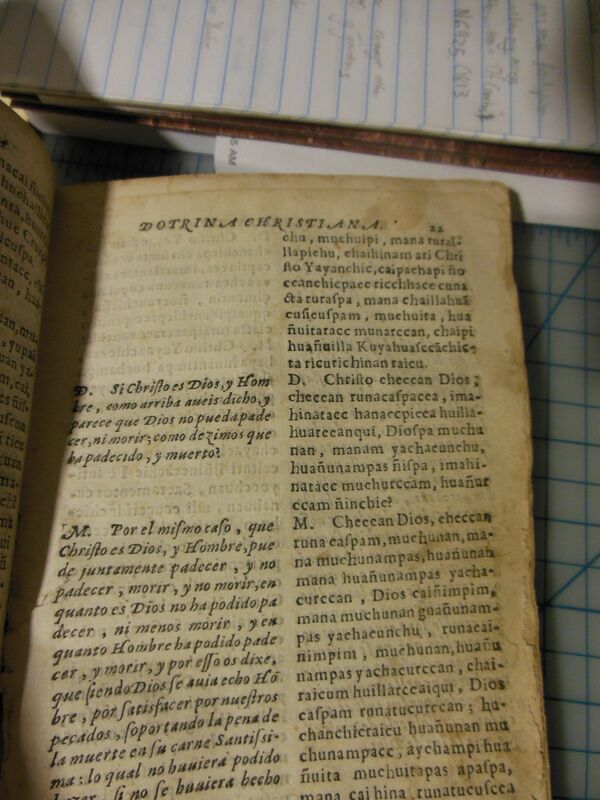 The book in question is a bilingual Spanish-Quechua edition of the Jesuit Cardinal Roberto Belarmino’s Doctrina Christiana, published in 1649; it fits within our Pre-Columbian collection because of the Quechua text. 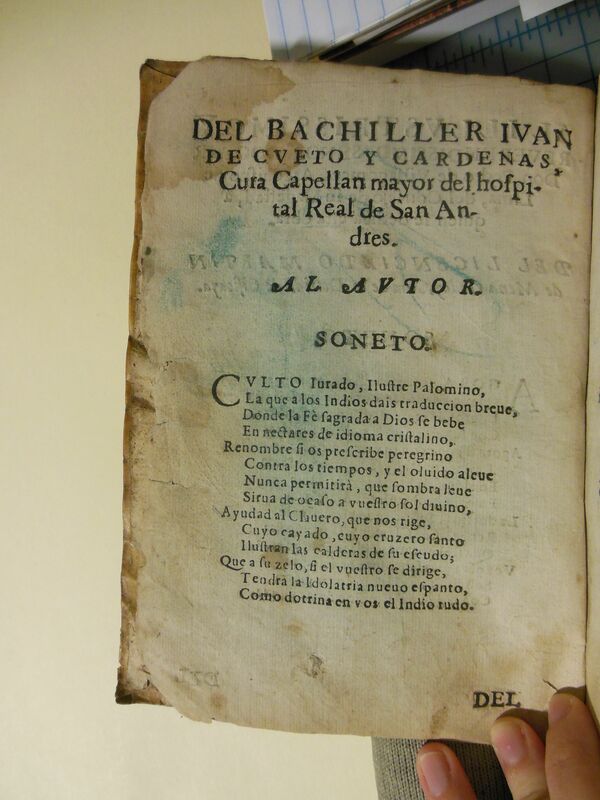 The remains of a historical controversy also appear in Palomino’s translation of the Doctrina Christiana. In colonial Peru, there was a struggle between different groups of Christian evangelists about how to translate their faith into Andean indigenous languages. Quechua, for example, didn’t have a synonym for “God” as the Spanish understood the word. So some Christian thinkers argued that they should use the Spanish “Dios,” and that Quechua speakers would eventually come to understand it as a loan word. Other Christian thinkers insisted that evangelization would never succeed unless they could explain Christian theology using words from the local language, and tried to come up with work-arounds for important concepts. Palomino’s translation clearly took the first side, as you can see from this page. 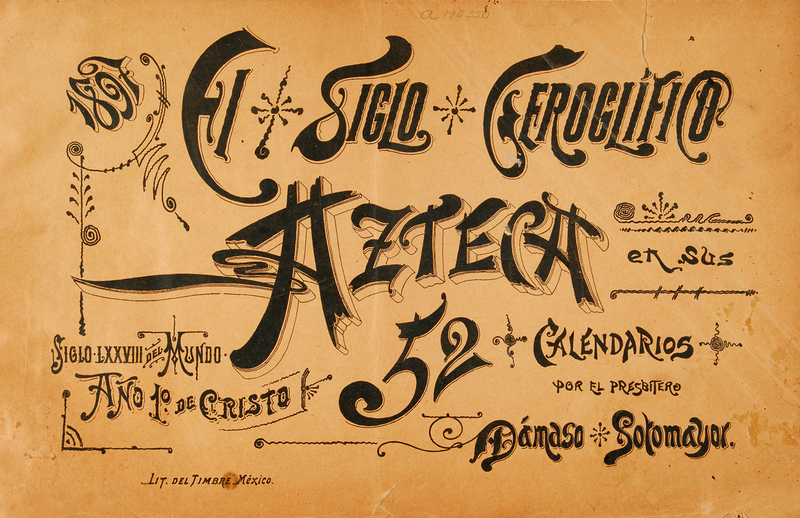 On the left, in paragraph D., the Spanish reads “If Christ is God [Dios]…” The corresponding Quechua is “Christo checcan Dios,” using the Spanish word. To my surprise, I didn’t see any marginalia in the pages of the text itself. I would have expected otherwise, because the front and back flyleaves were covered with people’s names. I assume, but cannot prove, that these were various owners of the book over the years. 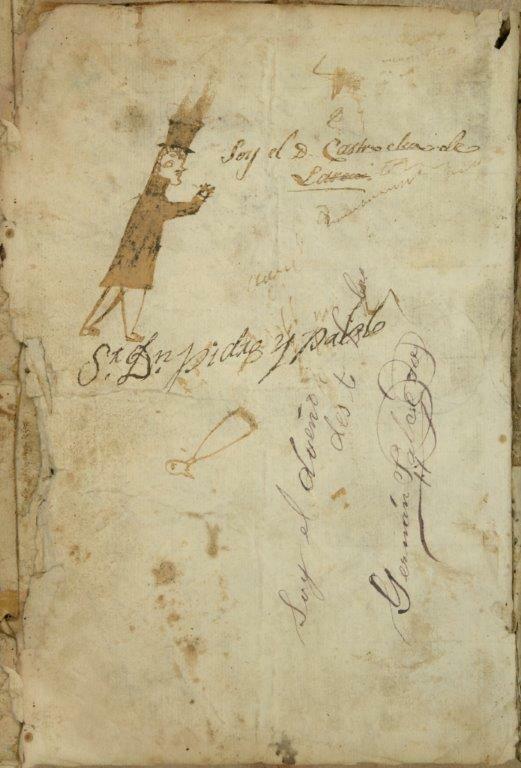 One such person who had their hands on this book also drew a little figure whom I like very much. I believe the drawing matches the text “Soy el D. Castro…,” “I am Don Castro…” since the ink is the same color. Maybe the figure is an illustration of somebody else, but maybe it’s a self-portrait! This is a time for new arrivals at Dumbarton Oaks, since twenty-something new residential fellows arrived last week. Because of this, I’ve been thinking about a different kind of arrivals: books at the library. In college, I never knew how the books I read came into a library’s possession in the first place. This week, therefore, I did some research around DO to find out how we do it. My sources were Bridget Gazzo and Deb Brown, our area studies librarians in Pre-Columbian and Byzantine Studies, and Sarah Mackowski, the Acquisitions & InterLibrary Loan Assistant. 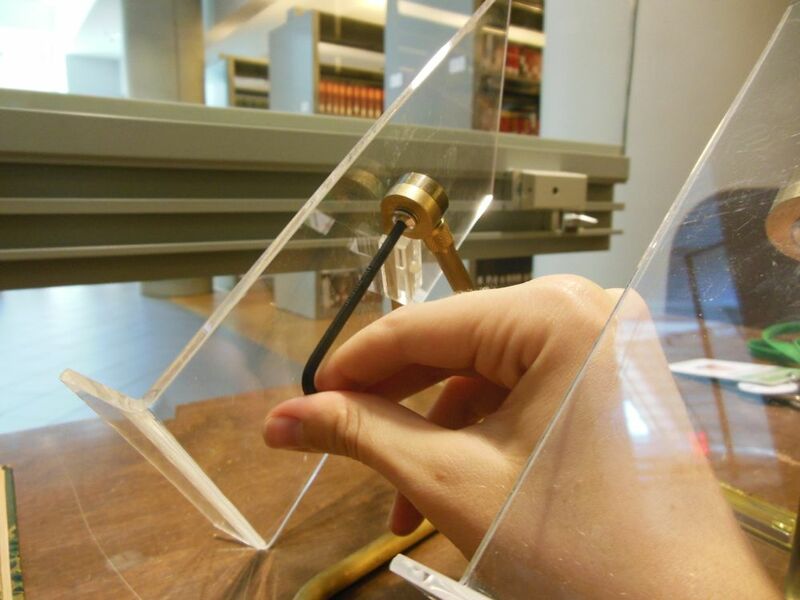 This post will cover works that enter the regular library collections and rare books. 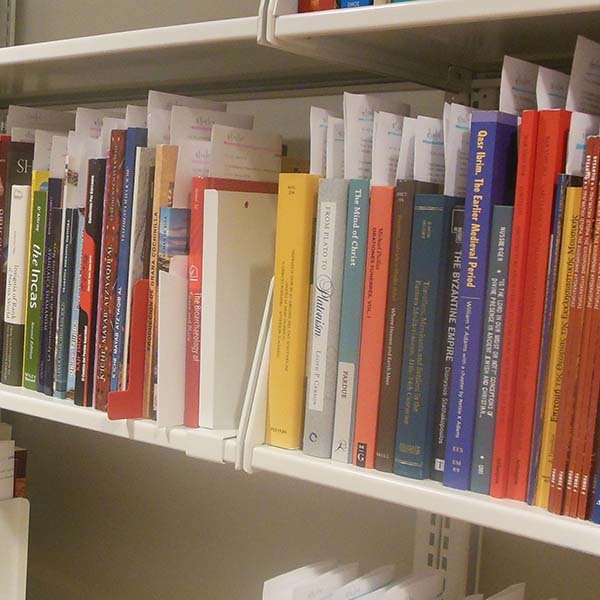 To make sure that our collections are up to date, we’re always acquiring new books. (“New” not meaning newly published, but new to us. We buy both recently published books and ones that came out some time ago.) The librarians do a thorough job trying to ensure both depth and breadth. 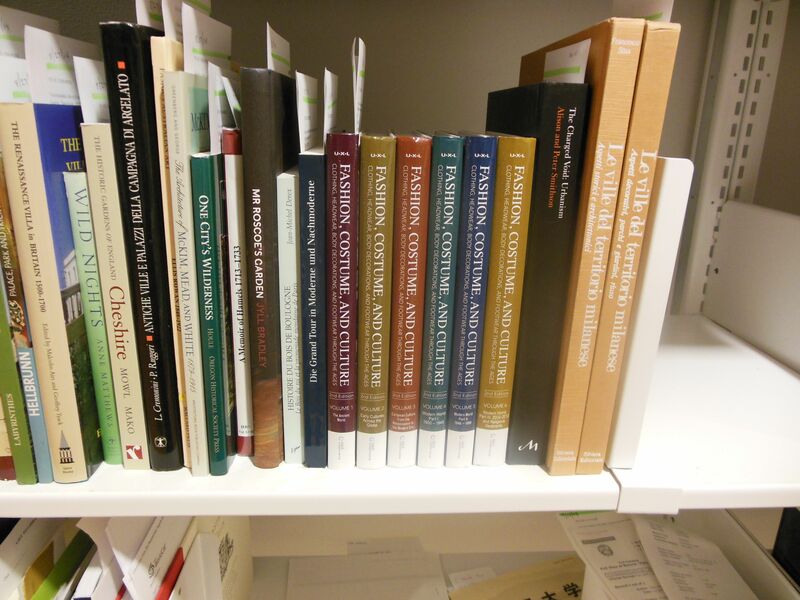 Recently, for example, Deb ordered some books to make sure our collections represented scholarship on the central Asian nomads who interacted with the Byzantine empire. When Deb finds such books, she puts in a request, and it becomes the province of the acquisitions staff. 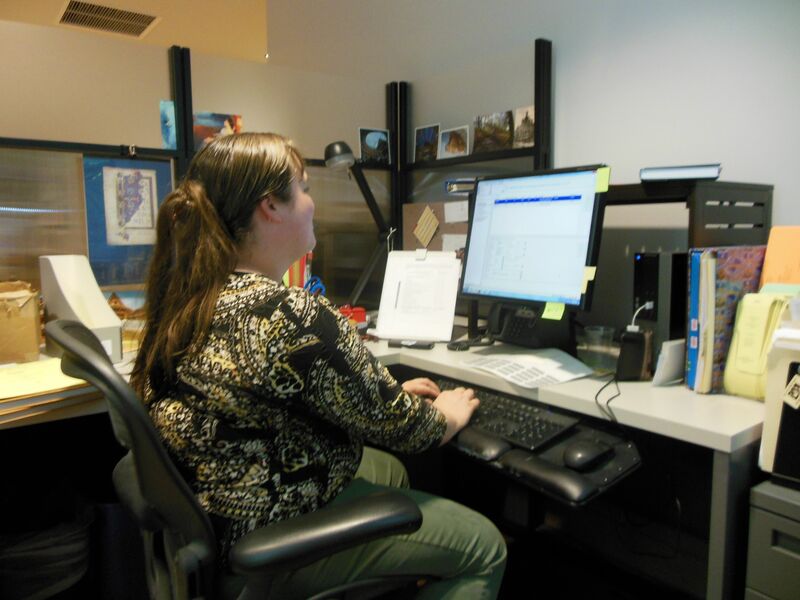 These librarians handle both the majority of books that the Dumbarton Oaks Library receives through its regular processes, as well as special requests on nomads or whatever else. Acquiring rare books, on the other hand, is often a long-term project, because years may pass before a copy of a certain title comes on the market. Each rare book, therefore, has its own story. 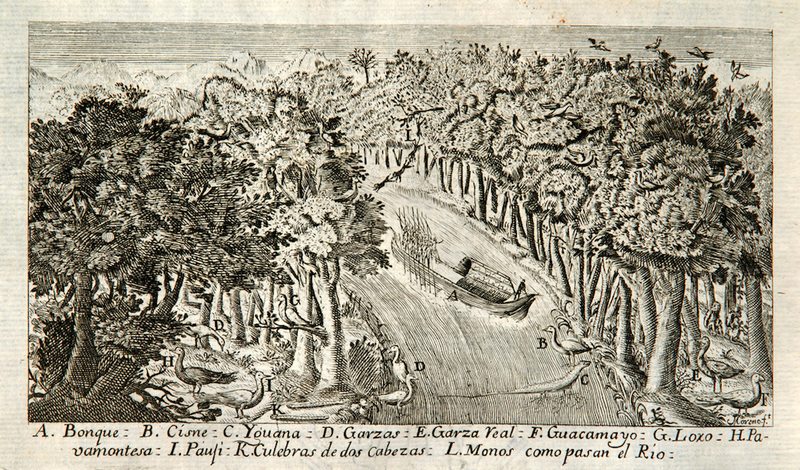 One recent acquisition in Pre-Columbian Studies was the Relación histórica del viage a la América meridional by Jorge Juan and Antonio de Ulloa, an account from the most significant scientific expedition to colonial Spanish America. This was high on our list of desiderata for many years for its geographical and archaeological text and engravings. Bridget put the word out with her rare book dealers that we were interested in acquiring the title. After several months’ time, one of them located a copy.. Whether to buy that copy was a difficult decision, however, because it was both very expensive and missing a number of plates. Luckily, we were saved from this decision due to a pair of happy coincidences. 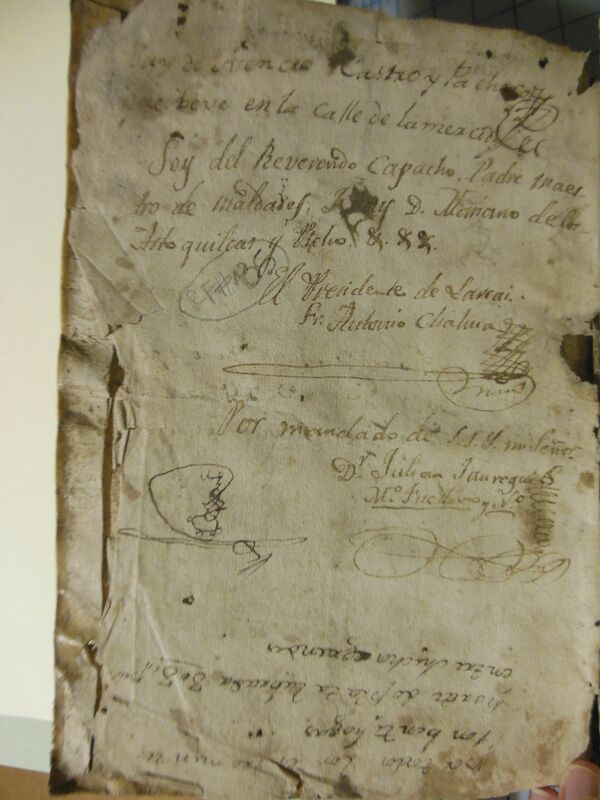 Almost twenty-fiveyears ago, Bridget went to a conference for Latin American Studies librarians that was held at the University of Virginia (SALALM), where she met a family of rare book dealers: a husband, wife, and son. I do not think anything came of it at the time, but a few years ago, the son took over the family business. In this digital world, he emailed a catalog to every person who had ever been on his parents’ snail mail list to receive catalogs including, as Bridget put it, “those from days of yore.” He happened, at that point, to have a copy of the Relación that was both finer and less costly than the other one we were considering. 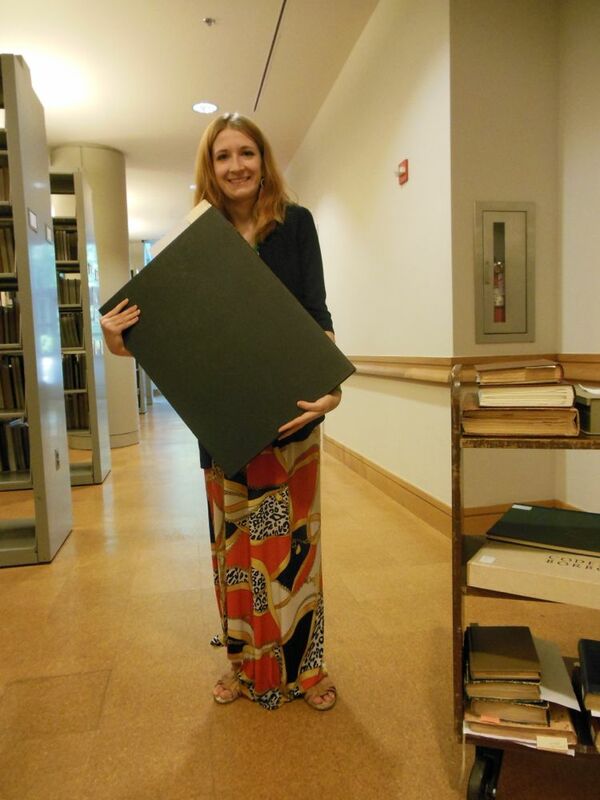 Our copy is currently up at Harvard being digitized; here’s a preview! For centuries after its completion in 537, the Hagia Sophia in Constantinople was one of the largest churches in the world. After Robert Van Nice spent fifty years documenting its every nook, crack, and cranny, it must also rank among the world’s most carefully recorded buildings. This level of detail, up until now, has not been very broadly available. Less than three hundred libraries in the world have a copy of Saint Sophia in Istanbul, much less easy access to both editions. Because Dumbarton Oaks has the rights to the book, it would have been possible to do a new edition. It would have been very expensive, though, and it’s so big that even the libraries that could afford it might not have been able to find a place for it! 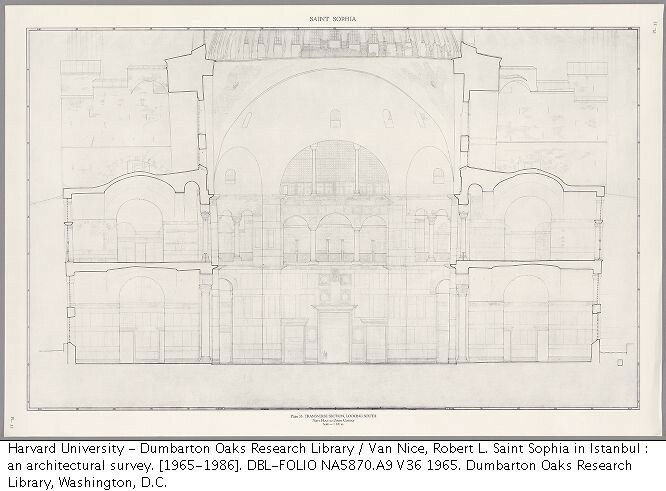 Now, though, we’ve had it digitized, so it is now totally available online. Have a look! I also enjoyed reading about the archive because, by spanning fifty years, it captured a not insignificant slice of world history, and so preserves moments sad, wonderful, and banal. Some pieces in the archive are sad and scary, like one letter from 1940 with the postscript “The world seems to be crumbling about us.” (7) Others struck a personal note, like the mentions of Robert College in Istanbul, where my great-grandfather also spent time in the 1930s. (8, e.g.) 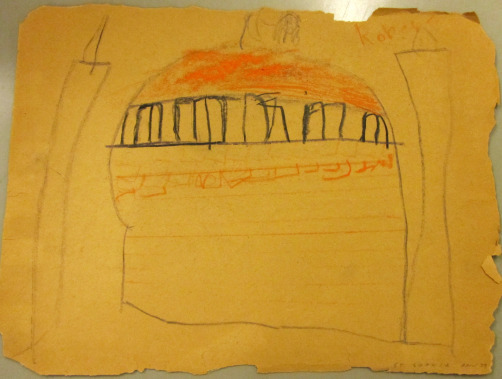 Still others are just charming, like this drawing that Robert Van Nice, Jr., completed of the Hagia Sophia when he was just six years old. *Correction: This post originally said the project was based out of MIT, but it was a personal project of Emerson’s, not an institutional one. This post also originally provided citations through links, rather than notes, which has been corrected with the notes appended below. Updated September 8, 2014. As we finish up the library exhibit on Pre-Columbian processions that I talked about last week, one more rare book caught my eye. 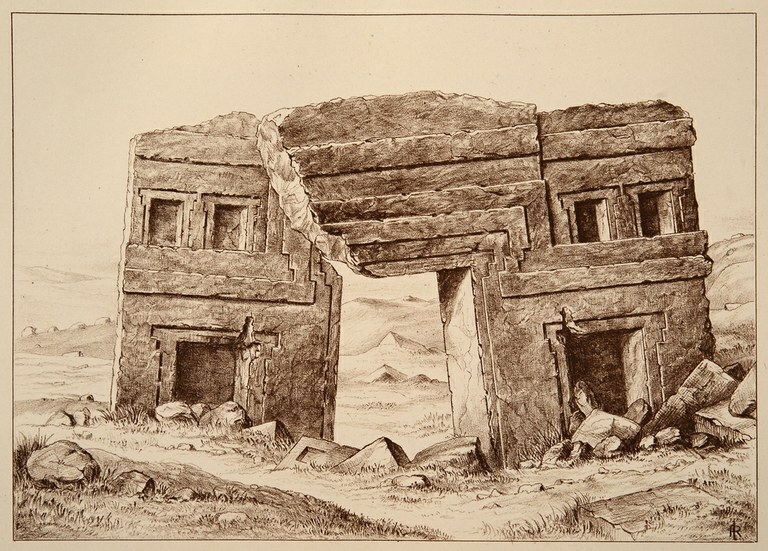 This one is called The Temple of the Andes, by R. Inwards, a British guy who published an account of his travels in the Andes in 1884. 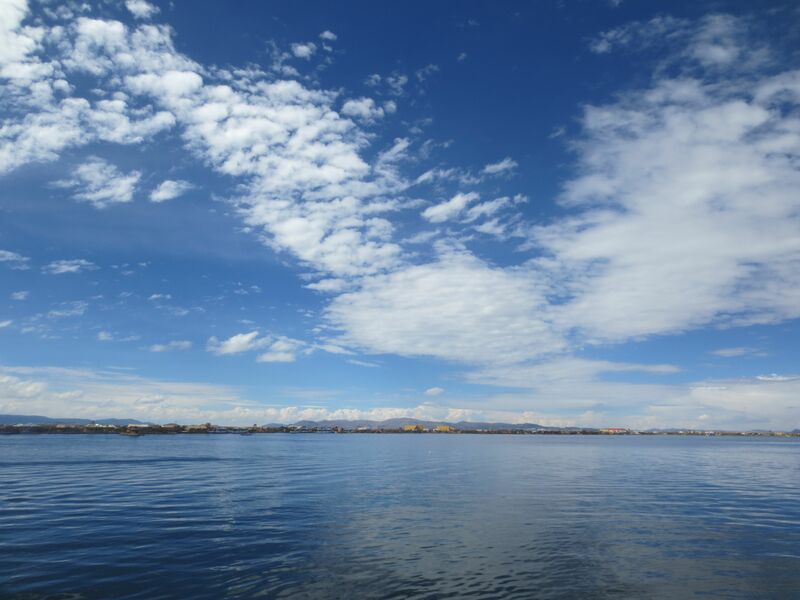 Inwards’ focus was on Tiwanaku, the center of a civilization that arose around AD 400 on the shores of Lake Titicaca, which now lies on the border between Peru and Bolivia, although his distinction between Tiwanaku and the Incas, both “Peruvians,” was often fuzzy. 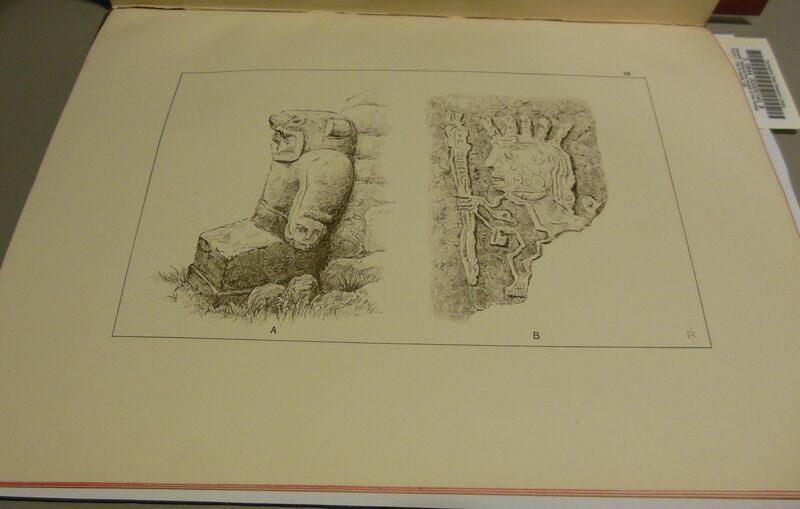 Some popular engravings of Tiwanaku come from this book, like this one of what’s known as the Gateway of the Sun. Colonial descriptions of Tiwanaku are extremely cool—authors described the ruins as stretching for hundreds of acres, and several expressed astonishment that it could have been built by humans at all. Unfortunately, Tiwanaku has suffered more than many archaeological sites from the depredations of time and inexpert reconstruction, so engravings like this provide valuable information for everybody. Wikipedia notes that one early reconstruction, in particular, “was not sufficiently based on research,” which is about as damning as I’ve ever seen that website be. In the latter part of the book, Inwards began to compare the civilization at Tiwanaku to other groups, mostly ancient. Based on certain colonial accounts, for instance, he noted, “It is curious thus to notice at how many points the religious system of the Peruvians came into contact with Egyptian, Jewish and Mohammedan, and even Christian observances,” (29). Most of the writings he cited were from Spanish missionaries; I would like to point out, therefore, that their assertions that Inca beliefs often coincided with Christian ones must usually be taken with some grains of salt. Inwards particularly emphasized Tiwanaku’s similarities with Egypt. Of his illustration below of Egyptian (left) and Tiwanaku (right) figures, he comments that the figure on the right “shows the peculiar mixture of the animal and human forms, indulged in equally by the Egyptians and the Peruvians” (30). 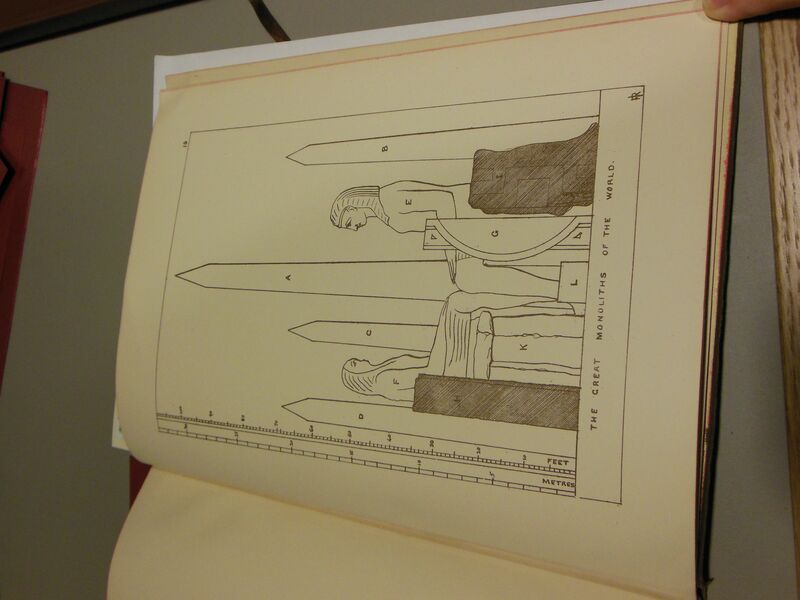 Inwards also included this eccentric comparison of scale. A through F are Egyptian obelisks or statues. G is the roof of a medieval king’s tomb, placed sideways. 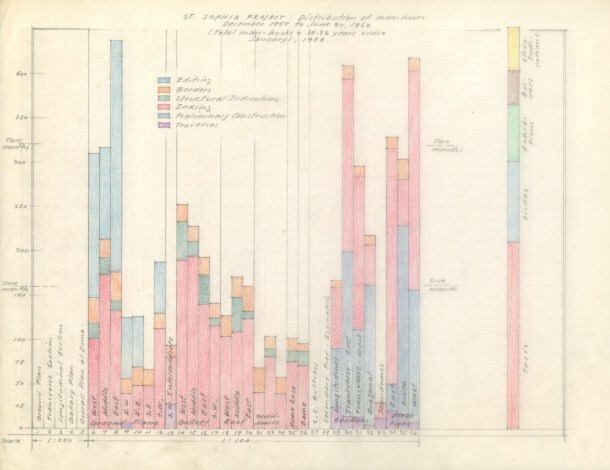 The shaded shapes H and I are from Tiwanaku, K is the largest stone at Stonehenge, and L “is one of the largest stones of modern London, being one of those at the base of the fine Doric columns in Hardwick’s grand portico to the Euston Street Station” (31). The idea that a stone from a London train station should be labeled one of “The Great Monoliths of the World” —I can only think Inwards meant this as a self-deprecating gesture to showcase the grandeur of ancient civilizations by comparison, but none of his text even hints at that! 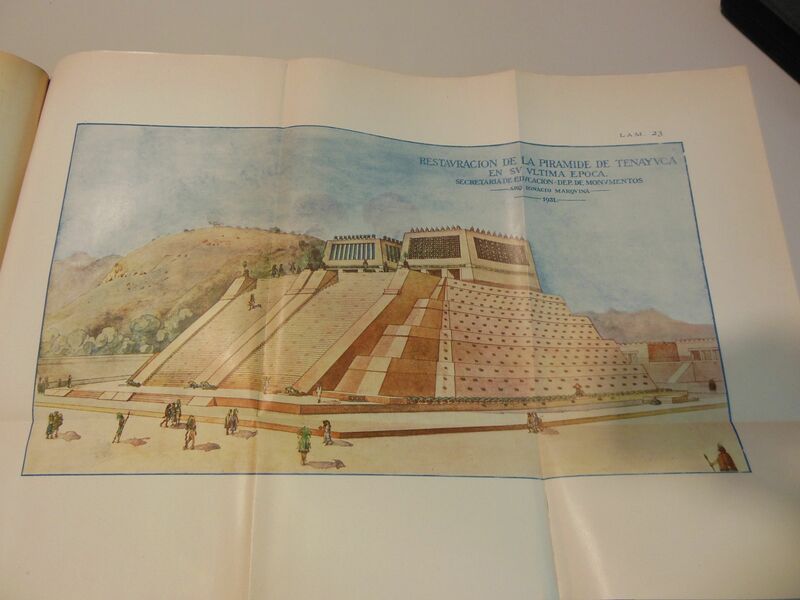 Inwards’ zeal for comparing Tiwanaku and ancient Egypt struck me particularly because of a Mexican book, published in 1897, we included in the last Pre-Columbian library exhibit. 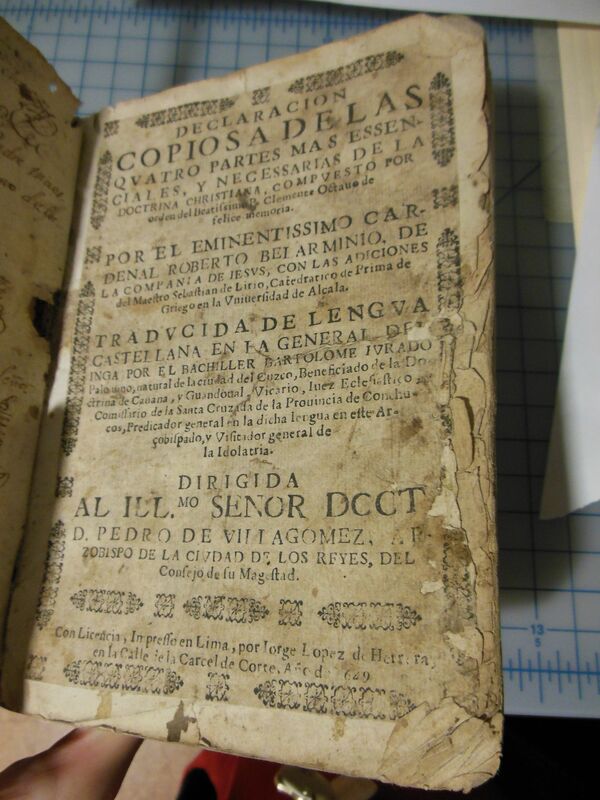 This book, La clave jeroglífica aplicada á la conquista de México, was a study of the Aztec calendar and calendrical glyphs, I am not sure to what end (despite reading half of it), so the Egyptian system of hieroglyphs came up several times as a point of comparison. Was there something about the last twenty years of the nineteenth century that made people draw comparisons between indigenous American civilizations and ancient Egypt? Maybe these two books are just a coincidence, especially since the Egyptians have the world’s most famous system of hieroglyphic writing. Now that I’ve seen them, though, I’m on the look-out for more examples! PS The Temple of the Andes is also available online. So if you want to explore more of that one, you can! 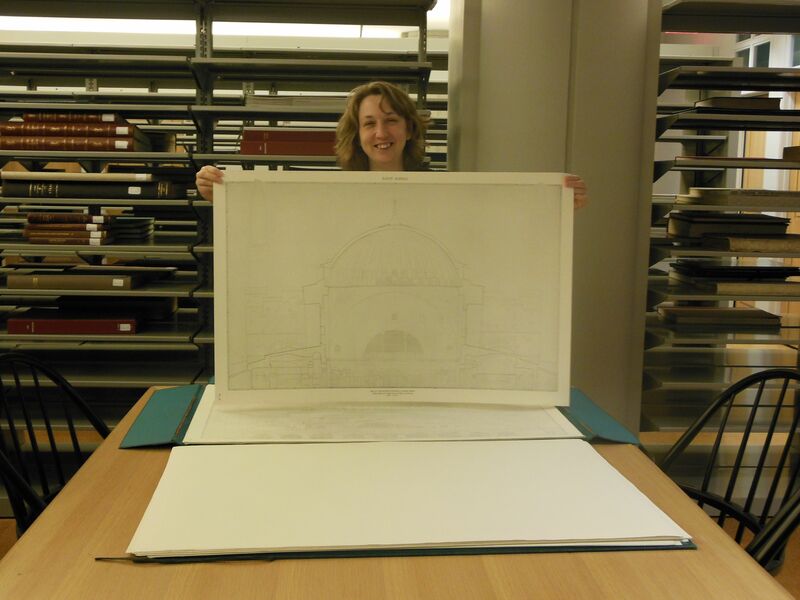 As I mentioned last week, Bridget and I have been working on our next library exhibit. 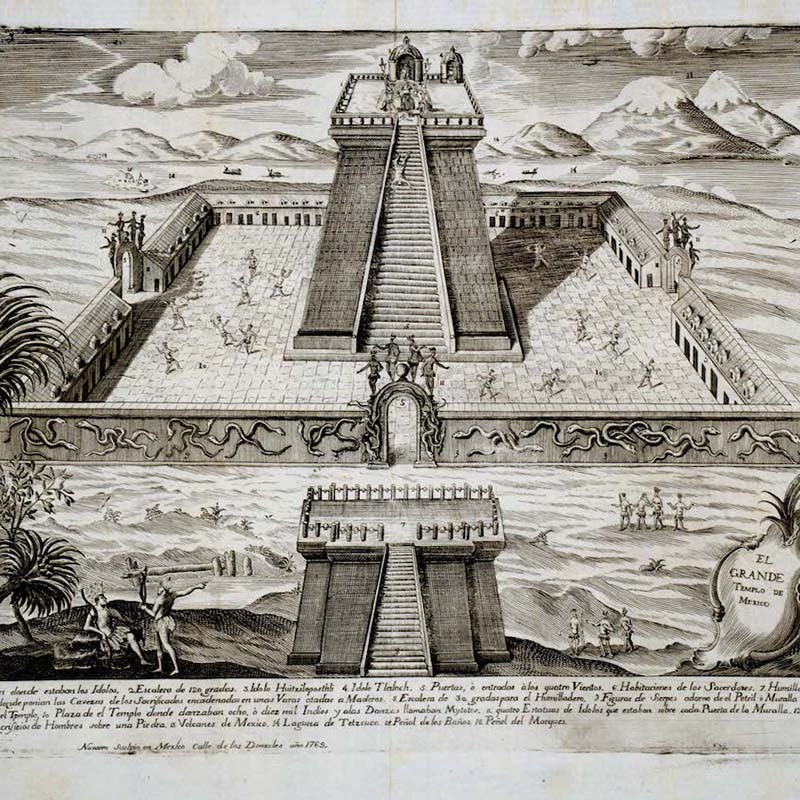 This exhibit will highlight material from the Library and Archives’ Pre-Columbian collections—whether in the Library, the Rare Book Collection, or the Image Collections and Fieldwork Archives (ICFA)—and is designed to accompany the upcoming Pre-Columbian Symposium on processions. 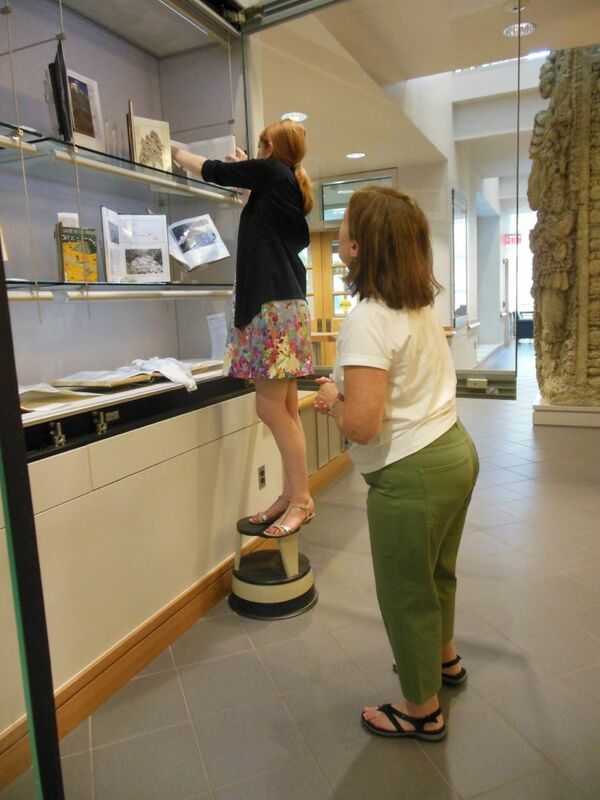 Right now, we’re finishing touches for the on-site exhibit as we work on the corresponding online exhibit. Since the on-site exhibit is mostly finished, it seemed like a good time to share what’s been going on behind the scenes! These cases are empty no longer! To make a book exhibit, the first thing we have to do is pick the books and other materials we are going to display. 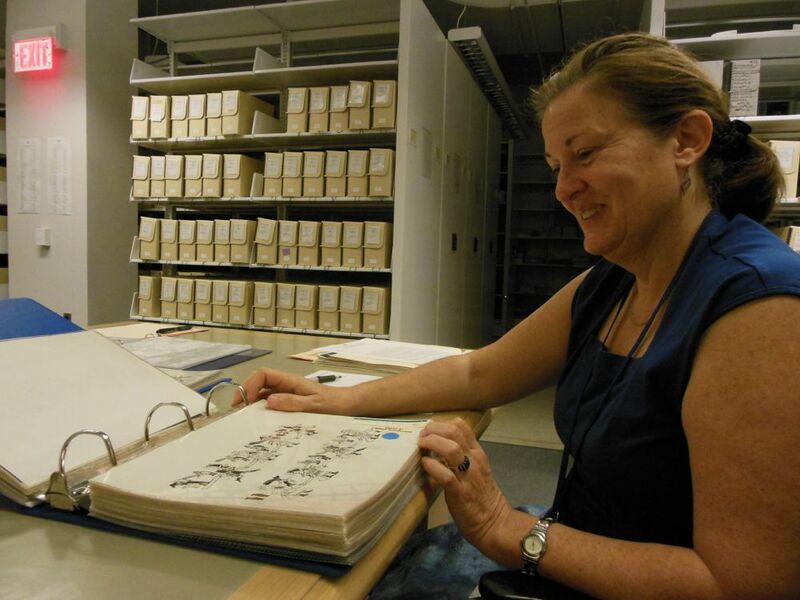 Bridget Gazzo, the Librarian for Pre-Columbian Studies, created our initial list of books. 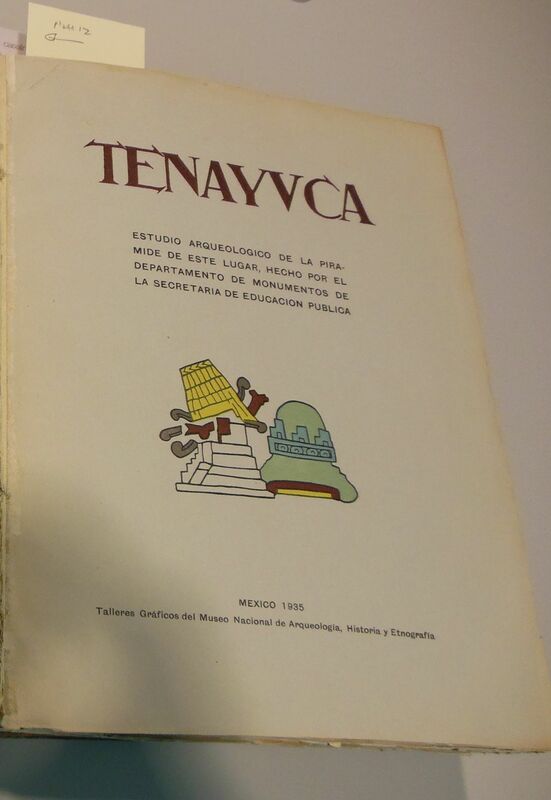 These included both scholarly works, so we could research Pre-Columbian processions, and rare books. 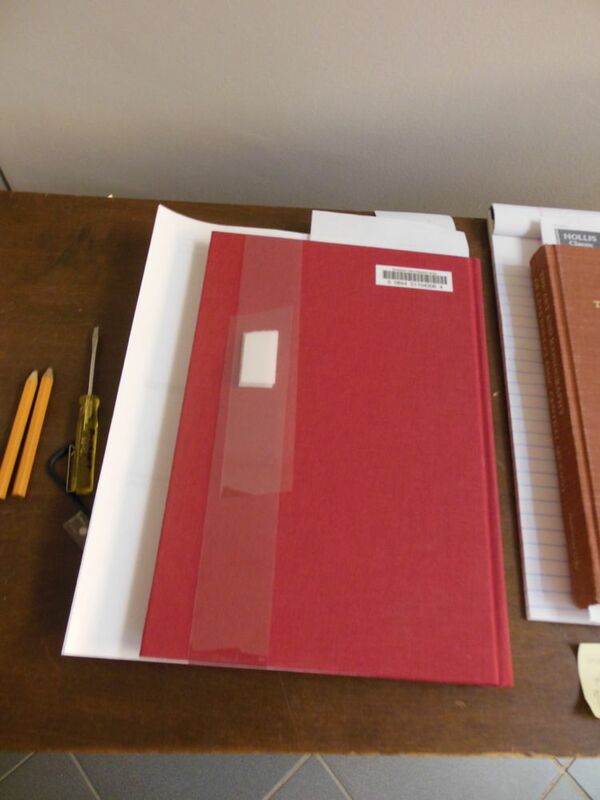 Once we assembled the rare books (and a few modern ones with good pictures), we went to the Rare Book Room to choose the best images from each, using strips of archival quality paper as our bookmarks. We examined both nineteenth and twentieth century travelers’ accounts and some facsimiles of extremely rare manuscripts. 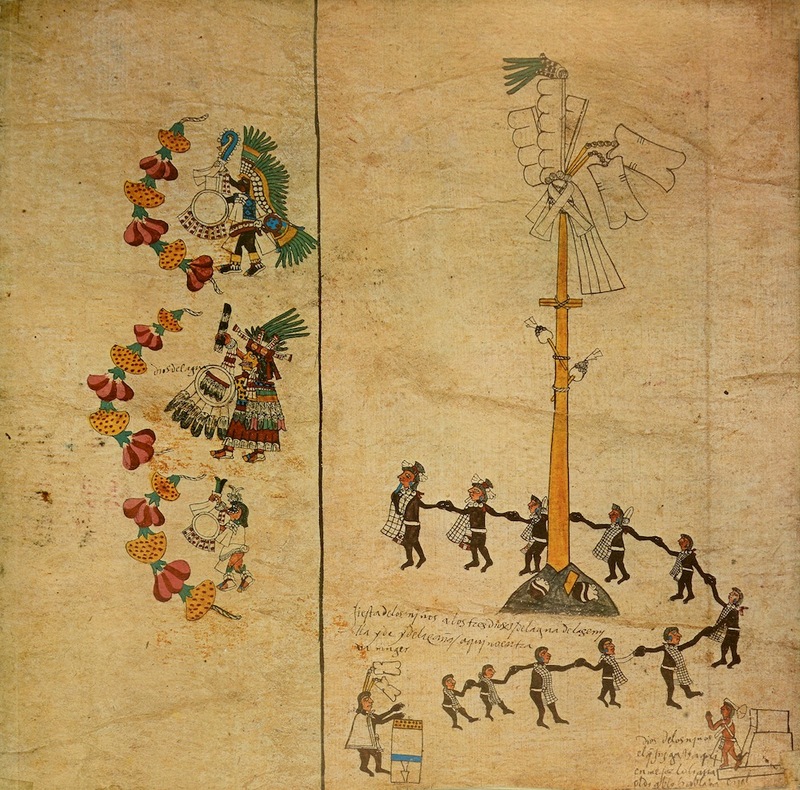 (Our facsimile of the Getty Murúa, an illustrated manuscript from Peru, is just beautiful! 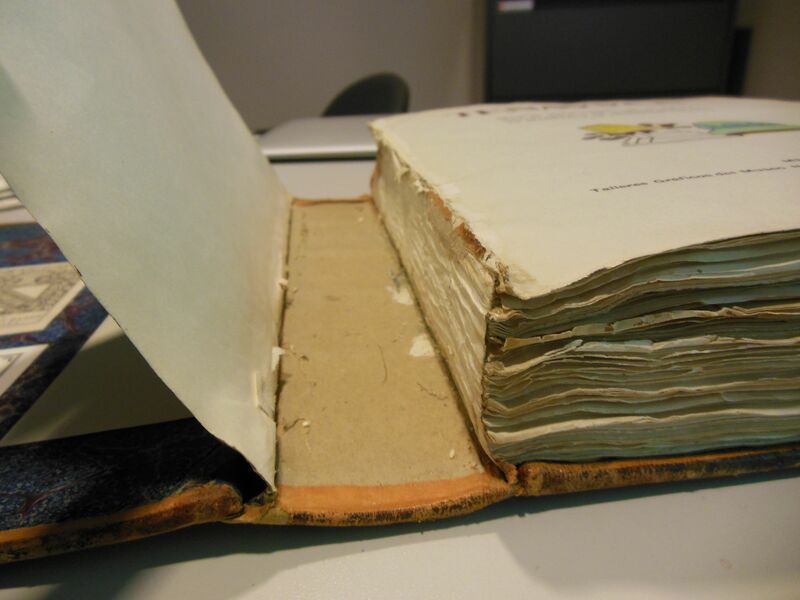 It’s so carefully done that they even recreated the little holes in some of the pages.) If we’d left ourselves more time for this part, it would have been any bookworm’s dream! We were in a hurry, though, because digitizing images for the online exhibit required an appointment with a photographer. So after we finished choosing the images, we trundled our cart of books down to Joe Mills’ office. Joe is a Dumbarton Oaks photographer currently working on a massive project on Byzantine seals, but he also took the photographs that we’ll have in the online exhibit. This is a trickier process than you might think! So much so that I don’t have any pictures from it, because I was busy holding the books steady while he photographed them. At last, we settled on three themes that we’ll use both online and on-site: pathways, plazas, and processions. 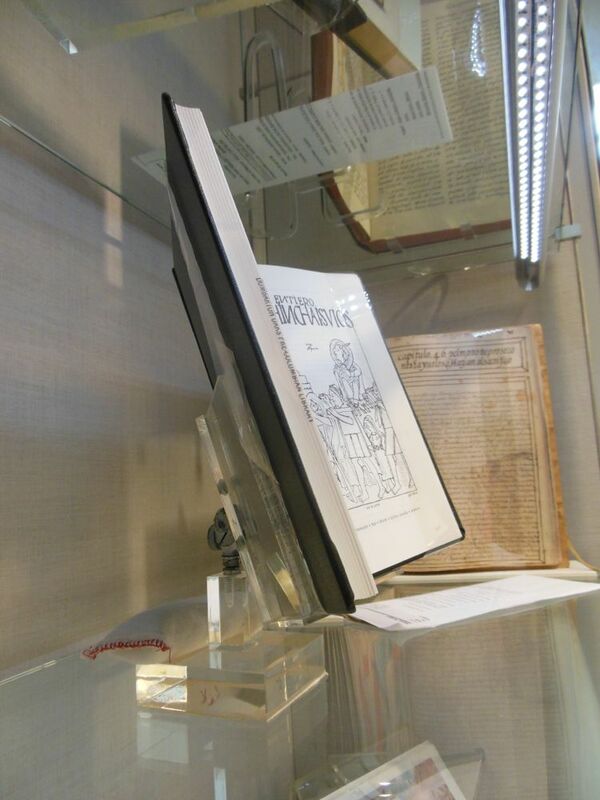 There are four display cases in the library, which have each been assigned a theme; “processions” gets two of them because it’s the most important. 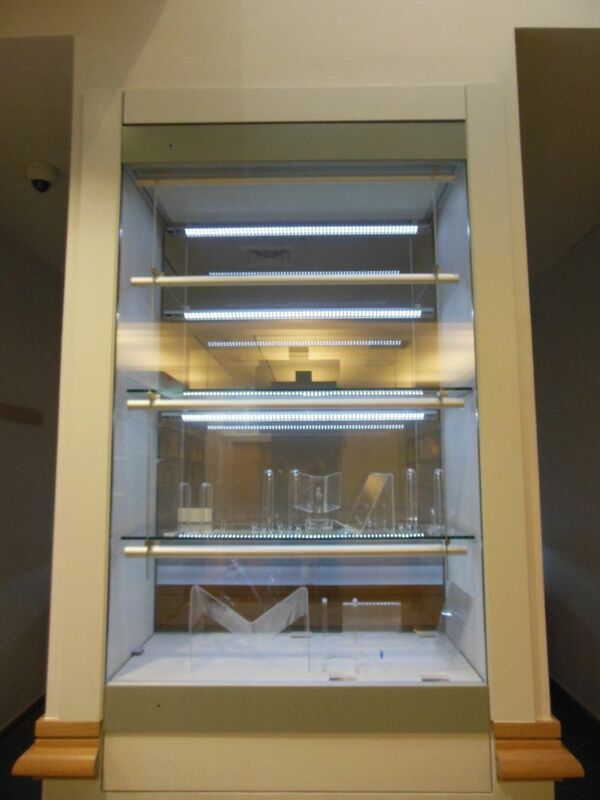 Three of our cases are vertical ones that look like glass bookshelves; the fourth is a big, low case, much deeper than the others, where we can put books like the one that was half as tall as me. Once we have distributed the books to their cases, it’s time to strap them in! To set up each book, there are two steps we have to perform. First, we have to strap the books to the right page. 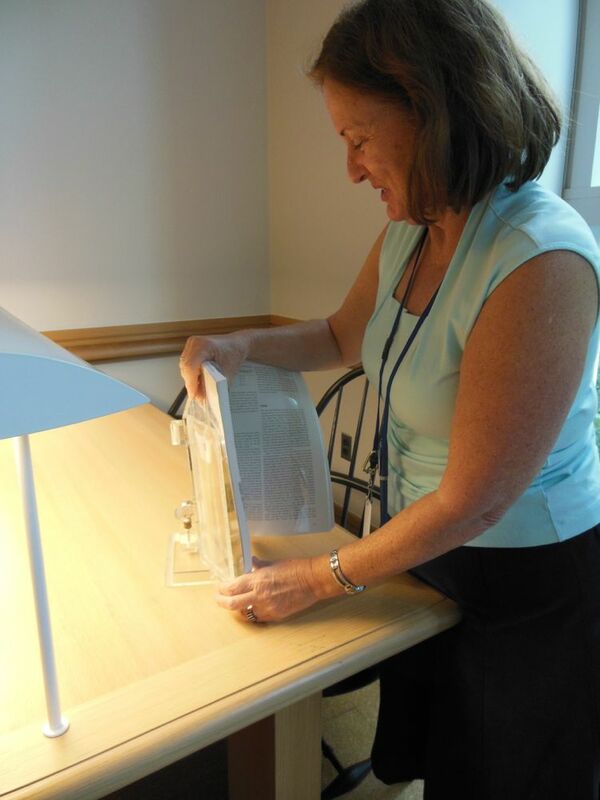 We do this by looping a clear plastic ribbon, to which we’ve attached velcro strips on facing ends, around the book. Then we attach the velcro together behind the book, where you can’t see it when it’s open. Our next step is to put each book in its own stand. Our stands are top-of-the-line, but it’s still a very fiddly process. One consideration is the angle at which we’re going to display the book: books on the bottom shelf need to be facing up so that you can see them without bending over. Books on the top shelf, on the other hand, need to be as close to ninety degrees upright as possible, so that they don’t point at the ceiling rather than at viewers. Another problem I encountered was the weight of the books. In the photo below, there’s a beanbag weight on the back of the stand, because it’s a small stand carrying a heavy book. Without the weight, the stand fell forward each time I let go of it! A last variable, and the most difficult one, was the “tightness” of books, a term I have recently learned. When you open some books, they are perfectly happy to stay lying open, possibly until the end of time. Magazines, for example, are usually not tight—you can easily leave them open to any page. Some books, however, are “tight.” This means that the spine has sufficient tension that if you laid them open flat on a desk, for example, they would probably close again. We practically had to wrestle some of our books into submission! This sometimes involved solutions with multiple straps, a lot of velcro, and a weight or two just in case. But all of that is finished, and all the books are happily locked into their cases. Check back in early September for an announcement when the online exhibit goes up! Dumbarton Oaks seems kind of sleepy in August. The summer population of students and interns has departed and next year’s fellows have not yet arrived, so the number of people around the place is diminished. Despite some remarkably nice weather for a Washington summer, things are still a little subdued. 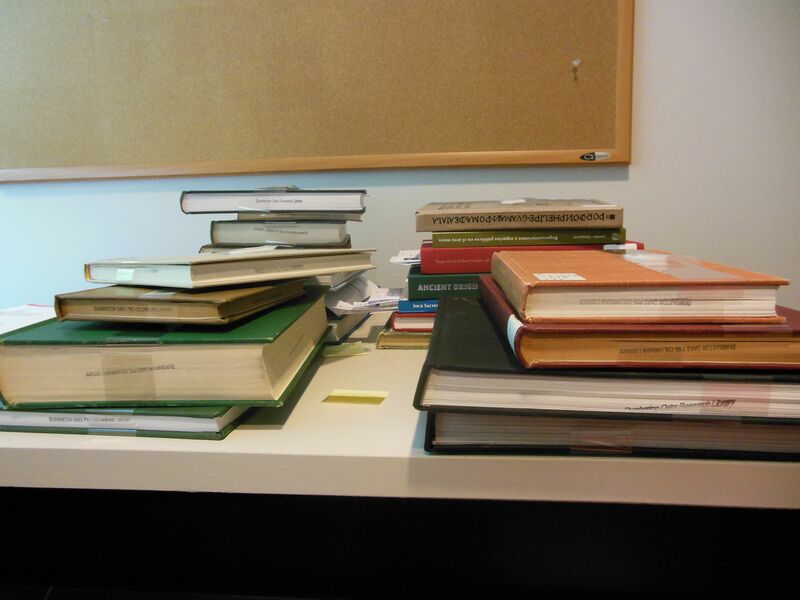 Books for the exhibit are piling up – and this is only a few of them! Much of the exhibit will emphasize the importance of the space through which people proceeded. Just as the Macy’s Thanksgiving Day parade has to be held in Manhattan (I find it nearly impossible to imagine it in the suburbs), so too did the space for Pre-Columbian processions matter, and matter a lot. One type of space the exhibit emphasizes is the plaza, which in Mesoamerica was often paired with the pyramids we associate with Aztec or Maya sites. This emphasis on space, both in our exhibit and in the symposium itself, helps offer a corrective to archaeology’s tendency, sometimes, to treat buildings as though they were intended to stand separate from their environments. 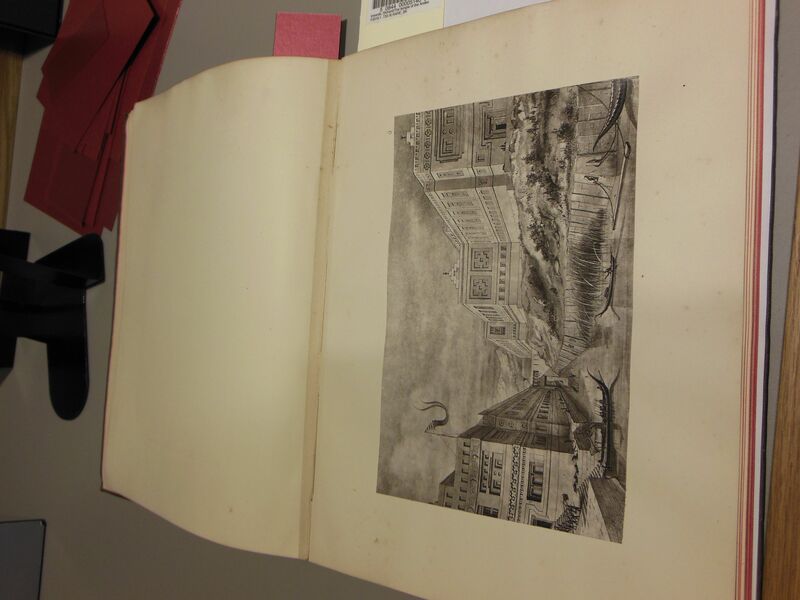 One rare book we can’t use in the exhibit shows some good examples of this tendency. I liked this book, even though we can’t put it on display, so I’m going to show you some pages from it now. Among other things, the report contains plans of the pyramid in each stage of its construction, although I can’t immediately verify their accuracy. The image above shows the page on which the plans of each phase of the temple could be compared with each other, so readers could understand how the site changed over time, getting bigger with every iteration. The authors’ hypothetical illustration of what the final phase looked like when it was new is below. This page also shows what I mean about taking buildings out of context—although you can see a bit of the pyramid’s surroundings in this image, most of them are cut off. And that’s the most we see of the pyramid’s context in the entire book! Most of the images look more like the line drawings above, even though in most of Mesoamerica, the pyramid wasn’t meant to be understood alone. We can’t understand this site without understanding the pyramid, so this book represents a necessary part of that effort. In our exhibit, however, I hope that our emphasis on the plaza and the processions that took place in it will help viewers focus on how the complex of pyramid and plaza worked together when they both were built. As for why we can’t display the book right now, I’m afraid it needed a visit to the hospital of injured books, which I’ll profile in an upcoming blog post. When I was browsing some old entries in this blog for fun (a leisure activity I highly recommend), I came across this post from way back when, called “Steps & Stairs.” That post is about steps, movement, and the rhythm of walking throughout the Dumbarton Oaks gardens, so if you’re interested in processions in a very different context, that’s one place to start! Hello to all our readers! I just want to make a note about the schedule for the blog for this coming year, separately from our regular posts. Because I was hired, among other things, to do social media, there will now be blog posts here every Friday until next July! We’ll have some special posts at other times of the week, too, but from now on there will be a regularly scheduled update each Friday. Look for the first one in this new schedule tomorrow!